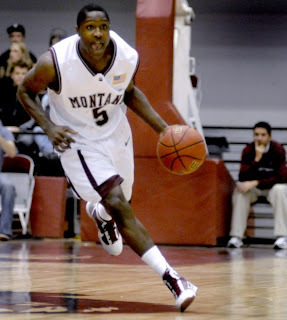 Montana took down Idaho 57-52 on Thursday night, mostly on the back of an outstanding game by junior PG Will Cherry. His 24 points certainly didn't hurt. The career-high 11 rebounds - from a 6-foot-1 point guard - were crucial. His 4-for-6 effort from 3-point range certainly got the crowd of 2,684 fired up against the Grizzlies' former Big Sky Conference rival. And the six points Cherry limited the Vandals' Deremy Geiger to - 10 below his team-best average - certainly looked big after the Griz survived a near second-half collapse. After struggling a bit in the first two games of the year, Cherry played like the First-Team Big Sky player that he is against the Vandals. His 24 points and 11 rebounds were game highs, and the rebounds were especially important for a team that struggled rebounding earlier this season. He also led the team with 4 assists and 2 steals, and played outstanding defense on Idaho G Deremy Geigel. All in all, it is far to say he carried the Grizzlies. Cherry needed to carry them on this game, because once again the frontcourt did not produce. Still without Derek Selvig, here is the stat line for the Grizzlies three bigs (Mathias Ward, Billy Reader, Eric Hutchison): 64 minutes, 9 points, 8 rebounds, 11 fouls. That is simply not going to get it done. Even if they do not provide a lot of offensive pop (which Selvig will help provide when he is back), they need to contribute rebounding the basketball, where they have not been good. Mathias Ward had 1 rebound in 32 minutes. Montana is 3-1 but there is certainly a lot of work to be done to get to where they want to be. Wiith games at San Diego on Sunday, and then a trip to North Dakota and home date against Long Beach State next week, they quickly have a chance to pick up some nice wins. According to Griz Basketball, "Selvig was not in uniform Thursday, but he was out of the boot that he’s been wearing since spraining his left ankle in an exhibition win over Lewis-Clark State on Nov. 3." The Grizzlies are getting better, but they need the bigs to show up this week. If they do, Montana has a chance to distingush themselves from a lot of the Big Sky. After Long Beach went into #9 Pitt and upset them this week, I don't know that I have them penciled in for a "w" in Missoula anymore. That is, I don't believe it's an easy win for Montana. Yeah, LBSU was top 2 in the Big West to start the year and there was even talk before the season that they could have a chance at an at-large bid. Will Cherry vs Casper Ware, their PG should be one heck of a matchup! A WAC win is always a good win for the 'Sky. Griz will be ok when Tinkle's son gets back on the court from injury.